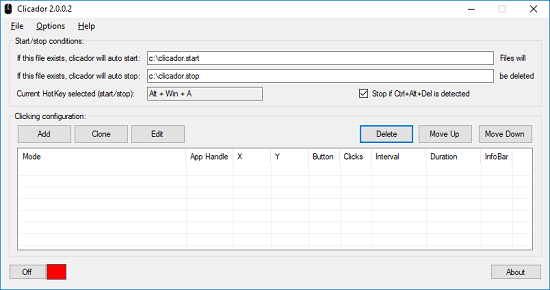 Clicador is a free mouse auto clicker software to auto click in minimized windows. There are plenty of other mouse clicker tools but this is quite a unique software. It lets you auto click inside of an application or program which is minimizes. Though you can use it as a normal auto clicker to click anywhere on screen, but here I will focus on its ability to click inside applications that you have minimized. It uses the application handle to identify the target program to click inside. And you can configure it in easy way to do that. In addition to this, you can create multiple tasks in it to auto click anywhere on the screen. One advantage of using auto clickers is that they can automate tasks for you and save you time. But the problem with most of them is that they can only click on the application which have focus or are visible on desktop. But Clicador removes that limitation by using the handle of running applications. So no matter if the applications are minimized or maximized. It will always able to click inside without any problem. Apart from clicking inside minimized applications, Clicador has almost same features as other auto clickers have. You can specify the number of clicks to fire, interval between each click, coordinates to start from, add random additions to coordinates for precise clicks, etc. You can configure all this in the software and it will keep clicking in the applications accordingly. Here are the steps to use this mouse clicker software to auto click in minimized applications. Step 1: Get the software from this link and then run it directly as it is a portable software. The main interface of the software looks like this. Step 2: Click on “Add” button to create an auto clicking configuration. And in the configuration window, specify the corresponding parameters. Make sure that application is running in which you want to auto click. Next, click on the “Start/Stop capturing infos” checkbox and then hover over the target application to set the coordinates and application handle. To capture the handle and coordinates, press the spacebar. After that, click on “Copy Handle” button to add the handle and save the configuration. Step 3: When you have specified all the configuration, simply start the clicking process by clicking on the “Off” button from then bottom left corner of its main interface. It will start clicking in the same manner that you have specified in the configuration. You will see the number of clicks and time stats on the screen well. This way, you can configure Clicador to click in minimized windows. And it simulates the mouse clicks very smoothly and works very nicely as it supposed to do. You can use it to automate tasks for use in it testing of various other applications. 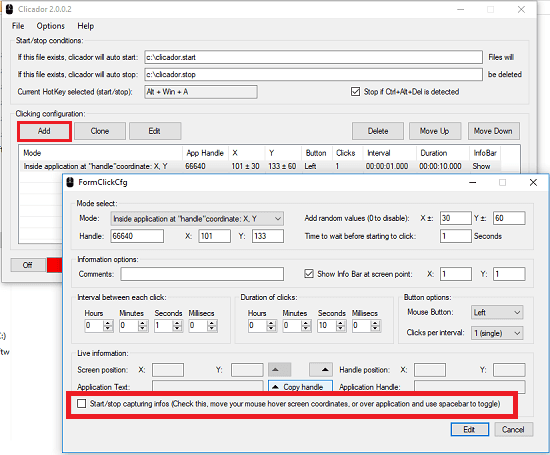 Clicador is a powerful auto clicker software that you can use to click automatically in the applications even when they are minimized. You just have to specify the clicking parameters and then it will take care of the rest. The steps above will guide you how to use this tool and auto click inside minimized applications.